I will preface this by saying I am a huge Megadeth fan and have been since the late 80's. This book is an uncut, gritty look into the business of rock and roll and Dave does not pull any punches here. 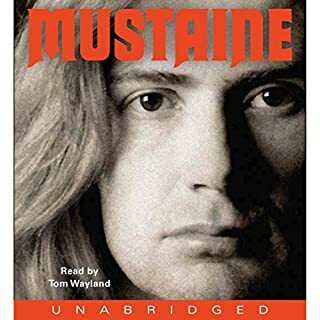 He gives a brutally honest look at his life from a very young age through the inception of Megadeth including all the ups and downs it took to get where he is today. The book was a roller coaster of emotions ranging from hysterical laughter to sadness and despair. This book puts a lot of the pieces together for you on the history and reasons behind some of the untold Megadeth madness that you don't get to hear as a typical fan. I have always loved Megadeth and respected Dave as an artist and this book only elevated my respect for him. This is a true story of redemption and a reminder that no matter how far you have fallen, there is always hope. Tom Wayland did an unbelievably good job narrating, he was the next best thing to Mustaine himself reading. I blow through a lot of audible books and he was truly excellent. Read this book, I gurantee you will not be dissapointed.